I'm going to run a catch can (actually got an air oil separator), but that intercepts the line from the oil neck to the intake (to vent the "crank case" pressure). The line I'm talking about goes from the purge control valve (little valve in my second image above) to the fuel return line. This doesn't go to the catch can at all. This line comes from the hard lines under the brake booster to the plastic UIM on a stock setup. So I traced the line from the catch can back around the SC to this T underneath the brake booster. One of the lines looks like it runs to the oil filler line and the other disappears back below the SC and I cant find it. I posted a diagram several pages ago with hand written notes from the prior owner on how to run the catch can which I believe he got from Cam. I gave it to the shop when they did the engine swap and were doing the plumbing. I will look for the daigram at my house tonite. Last edited by keck03; 09-20-2018 at 09:06 AM. Wow, it's been a month with no replies. I guess I'll take a turn. i got my engine, transmission, driveshaft, and exhaust back in. Pretty good progress. 200, I took your advice and removed all the insulation in the engine bay (not the hood though). It does look much better. I've been struggling to package everything I want to install in the engine bay just right (tanks, hoses, air/oil separator, coils, intake, etc.). I've been just burning a lot of time moving things around and trying to get a setup together. I did get a full respray done on the MazdaSpeed kit, plus a few extra goodies. Now I'm contemplating ordering a hood too. I can't leave well enough alone. It's pretty much winter here, so it looks like I'll be waiting until the spring to let her rip. At least she still looks good sitting still! I've read through the Pettit manual so many times, read so many descriptive posts, and gone over the parts and diagrams so many times I think I may be able to actually install mine myself at this point if I take a week or two off of work. Once I get back from deployment and I'm back stateside for awhile I'll definitely be bugging the hell out of everyone in this thread for tips and help, especially for all those confusing tube reroutes and wiring changes haha Looks super clean though, for sure man! There's definitely a lot to figure out for the install, and I'm learning along the way. If there's anything you get stuck on that I've already figured out, I'd be glad to help. I've got email alerts turned on for this thread, so I'll be relatively responsive here (same day, not same month lol). I'm really trying to study the house routing as I'm adding a bunch of custom/other stuff to my car and also don't want to hack everything up blindly. So hopefully I'll have good insight for you there. The wiring is easier than it seemed and I can tell you what you do and don't need to do. Awesome, the help will certainly be appreciated (and needed)! Before you get all of yours put together could you snap a few detailed pics of your wiring changes and what you did specifically to the ignition coil wiring? For instance, I think the manual has something about using a cork and paperclip to wrangle the pins of each ignition coil out of its plastic connector, then stripping the ground wire back out of the wire loom in order to separate it for more length for re-mounting the coils, then putting it all back together? Did I read that right? I feel like this is the kind of thing I might screw up. And the hose-rerouting gives me a headache to look at - it looks like at one point they have you take some of the hoses that would normally connect to the bungs on the intake air-box neck and/or throttle body, and cut them back and link them directly into each other using hose connectors so they bypass the air intake/throttle body altogether..? That part really confuses me, especially since I'll have to go off the beaten path because I bought the RX8Performance Pettit cold-air intake system which will likely make hose routing a bit different than the stock Pettit kit was 10 years ago. Anyway though, I'll be back stateside in 3-4 months and I'll probably try to start the install not too long after that; I think you said you're going to largely put yours on hold for the duration of winter, so I guess that would kind of line up our timelines better anyway. I'll keep an eye on this thread though as always, trying to learn more. Thanks again! Ill be working over winter, but with a little less urgency since I can't drive it until April. I didn't do the coil rewire. I talked to Charles at BHR (I have their ignition system) and he can make me an extended wiring loom. This way I don't have to worry about pulling these wires through the loom or cutting any. I was going to make a similar extension for the throttle body but Charles told me that the computer is very sensitive to resistance or delay on these wires, and changing them might cause serious electrical/control system issues. So I did pull these wires through the loom, it was easy. Just use a tiny screwdriver (like for a watch or something) and forget the cork and paper clip thing. It's easy, especially if you've depinned any other connector before. I'll figure out where I'm mounting the coils then get my extension made, and I'll be set. Last edited by obliterx8; 10-29-2018 at 06:41 AM. Charles makes me custom length wires for the coils to the plugs. I order a set every couple of years to refresh it. I just email him the lengths I need for each one. My prior owner extended the wiring loom to the coil location previously. My car has been really sensitive with the spark. Coils that work on other cars do not always work on mine. I recently traded a friend brand new BHR coils for his 5 year old used set of BHR coils since somehow my car liked his better. I have also noticed that the location of the grounding spot for the BHR kit should be clean, rust-free, and nothing else grounded to it. I also recently installed a reman throttle body to fix an error code and its running fantastic. It was pretty filthy after 47k miles of which 24k were boosted. I was having sporadic issues with A/F ratios and idle and then the throttle body went. Now its perfect again. I feel like we just got a big thumbs up from the forefathers. That means a lot. I'm hoping we can keep this thread alive, even though less people seem to value these forums today. Been missing the forum and the car. Your thread caught my eye.dont ever sell it... you will regret it if you do. This RX-8 was my first car. I'm doing my best to make sure I never have to part with it. I'm sure I'd regret it like you say. My grandfather (in his 80's) restored a '49 ford sedan a couple years ago, it was his first car (not the exact one). Even at his age, he wanted his first car again and I expect that I will too at his age (hopefully there's still gasoline then!). I saw what he went through to find one and restore it. It would have been way easier to never part with it. He didn't have that opportunity, but I hope I will. Time will tell. In the mean time, I want to make the car the best it can be without chopping it up. That's really what lead me to this Pettit kit. It gives a good power bump, isn't as temperamental as a turbo (or as risky IMO), and is pretty much a bolt on solution. I'm also hoarding Mazdaspeed parts to make sure I can keep it in good condition for the future. Wow that is a pretty nice first car! Don't get rid of it! I go on BAT once a month looking for my first car all the time but its rare to see a 1987 red integra pop up. How long have you had your rx8? Yeah, thanks, I'm hoping I won't need to sell it. I was fortunate to have a dad that was into cars, so I got something nice (though not American enough for his taste lol). It helps that I wasn't raising hell as a teenager either! I got the car new in 2006, I got to pick the color and stuff. I was also lucky enough to have my dad force me to store it for winters and drive a "beater" Durango instead. I didn't realize what the salt and snow does to a car at the time, but it's the reason my 8 still looks the way it does now. Carl should be able to get it dialed in quickly since he has one. Do you know if Carl can tune remotely via files generated by the COBB AccessPort? He tunes by sending a laptop to the customer and using Mazda Edit. I'm not going to say he can't use a Cobb, but it doesn't seem to be his preference. Lol no, I bought Mazda Edit. We'll just email logs and files back and forth. He does that for UK clients because the software is so expensive. Which MazdaEdit did you buy? Is the Personal Edition listed here for about $250 sufficient for our tuning purposes? Or do you need some kind of high-end multi-thousand-dollar "developer" level version? Yeah, the personal is sufficient, so long as you only plan to tune one car as it's tied to your VIN. He has the professional version so he can work with everyone. I believe that's what's on the laptop he sends out. Obliterx8 did you relocate your battery? I was going through your pics and admiring how clean everything is. You are really inspiring me to try to clean up and pretty my 8. Thanks. No, I just haven't had it in the car for the last 8 months. It'll go back in the stock location. It's just easier to work without it. I was thinking about relocating it, but don't know that it would turn out very clean and I don't know the right way to do it (I would have to figure it out). I also don't know what I would put there instead. I think I have room for everything I need (even if it's a bit tight). Oblit, I am in talks with Charles at BHR right now to make an extended harness for the coil relocation, but since I'm in the middle of the ocean I am unable to get to my car to measure... I'm trying to remember how far the distance is from the stock connectors to the place on the air-box tray where the coils would be mounted during the Pettit installation (including a few extra inches to reach the rear of the coils in case they need to be oriented in a weird way to fit or for the spark-plug wires to be able to reach the spark plugs down below) but I don't wanna end up with a too-short harness... 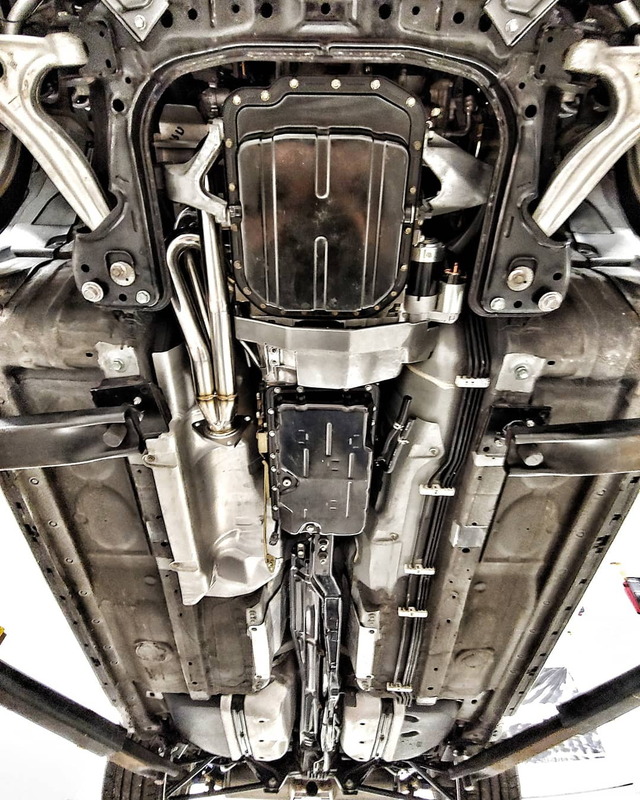 If you get a free minute, would you be able to peep into your engine bay and maybe give a guesstimate on a safe length to make the harness so it will reach? 14 inches, or maybe 18 to be safe? 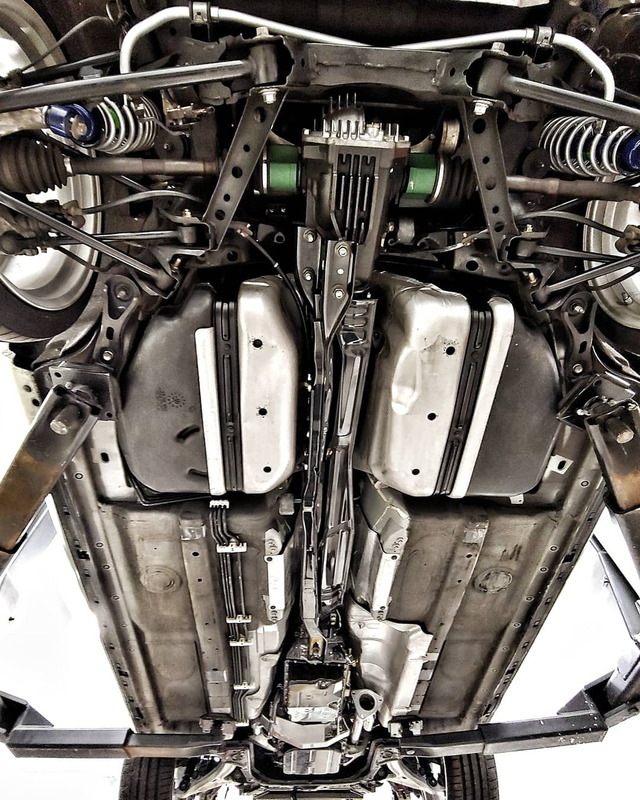 Or longer, since it apparently has to reach all the way around the passenger side of the engine in order to reach the coils since the compressor forces the whole harness away from its normal position on top of the engine block? Thanks! I can help you with that for sure, it just might be a while. I don't have the harness in my car now and I'm not putting my coils in that location. I'll definitely let you know as I'm able to figure it out, but I have to install other components before finalizing these measurements.